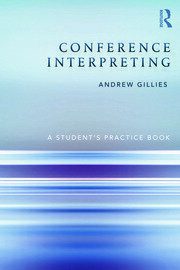 Andy Gillies is a freelance conference interpreter and working from French, German and Polish into English at a number of EU and European institutions as well as for private clients. Before training as an interpreter he trained and worked as a teacher of English as a foreign language. With that background interpreter training was a natural next step, followed by training of interpreter trainers and eventually writing books for student interpreters. I trained in, and taught English as a foreign language in London, Cracow and Cologne between 1994-6 before studying conference interpreting. In 1996 I started working as a freelance interpreter at the EU institutions in Luxembourg and I'm currently based in Paris, working for the European Parliament, the European Patent Office and the European Space Agency as well as for other non-institutional customers. I began teaching conference interpreting in 1999 and since have taught at the interpreting schools at the universities of Łódź, WLS Warsaw, UJ Cracow, UAM Poznan, FHK Cologne, ISIT Paris & EMCI Lisbon as well as training staff & freelance interpreters at the European Parliament. I also offer further training and training of trainers courses for AIIC (the International Association of Conference Interpreters). My books came about to fill what seemed to be big gaps in the conference interpreting literature market - starting with the English translation of Rozan's 'La prise de notes...' before writing my own material. Conference interpreting, conference interpreter training and training of trainers of conference interpreting.